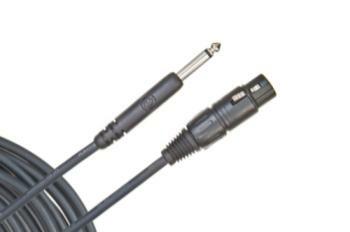 Planet Waves Classic Series microphone cables provide the ultimate in quality and value. The XLR-to-1/4-inch platform is ideal for powered monitors, for plugging a mic into an unbalanced input, and for those acoustic guitars with XLR male output jacks. The 25-foot length is ideal for longer runs and larger stages. Planet Waves Classic Series microphone cables utilize ultra-pure, oxygen-free copper conductors for low capacitance and pure signal transfer. A flexible molded collar provides outstanding strain relief for worry-free reliability. 95% shielding eliminates virtually all handling noise.